Background: Single incision laparoscopic surgery (SILS) has opened up new frontiers in minimally invasive surgery. However, several technical challenges call for innovations to facilitate a variety of maneuvers during these procedures. We herein describe various innovations done by us to achieve this. Methods: Innovations in SILS procedures since July’2009 till date in the Department of Surgical Gastroenterology, Manipal Hospital, Bangalore. Six innovative methods employed in a variety of SILS procedures are herein described. Results: Nienty nine patients underwent 101 SILS procedures. Six innovative methods employed in 80 procedures are described. The novel fundal traction suture of gall bladder was used in 61 patients undergoing cholecystectomy. 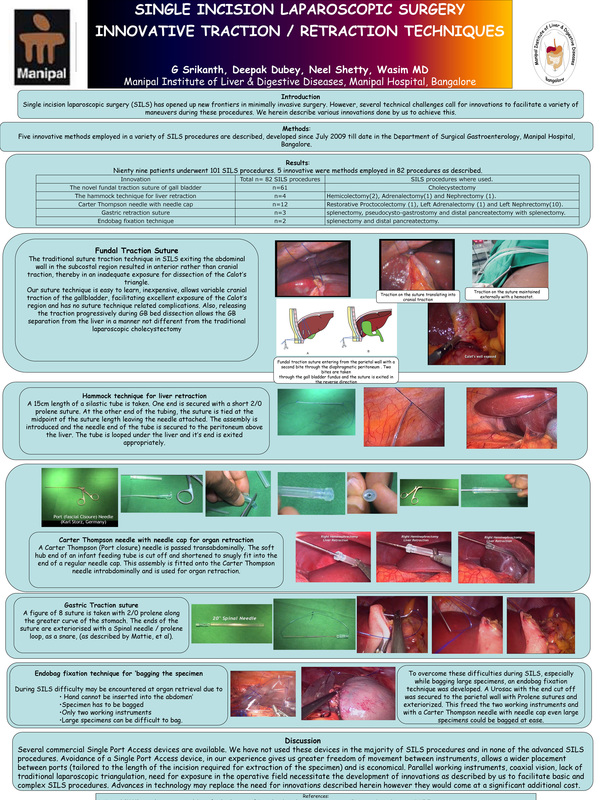 The hammock technique for liver retraction was utilized in four procedures; hemicolectomy(2), adrenalectomy(1) and nephrectomy (1). Carter Thompson needle with needle cap for splenic retraction in 12 procedures; restorative proctocolectomy (1), left adrenalectomy (1) and left nephrectomy(10). Gastric retraction suture (n=3) in splenectomy, pseudocysto-gastrostomy and distal pancreatectomy with splenectomy. Feeding tube suspension loop (n=1) for transverse colon retraction in hemicolectomy. Endobag fixation technique was used for ‘bagging the specimen’ following splenectomy and distal pancreatectomy. Conclusion: Technical challenges during SILS procedure call for innovations and the techniques described by us facilitate a wide range of SILS procedures. These are easy to learn and can be easily reproduced.